Mother’s Day is just around the corner. The gifts I love the most are the ones which come from the heart, or when my children take the time to do something for me. One thing that is always popular are Mother’s Day Coupon Books! This is a great way to surprise mom with gifts she can use all year long! Sometimes Moms just don’t need any more “things”. But, who doesn’t need a little help around the house? I don’t know a mom that wouldn’t love a coupon book full of help and love. Did you know, according to a recent survey, 75% of moms would prefer a clean home on Mother’s Day to being served breakfast in bed. In addition, 60% of moms would most prefer a clean house over other gift options like candy, flowers and a card—-I know I do!! I know a bucket of cleaning products might sound like a risky move for Mother’s Day, but what Mom would say no to a clean house? Not only a clean house, but a clean house that doesn’t require her to do an ounce of the work. So tell Mom to put her feet up for the day, maybe pop in her favorite movie, while the family cleans the house! Honestly, THAT sounds like a dreamy Mother’s Day to me! 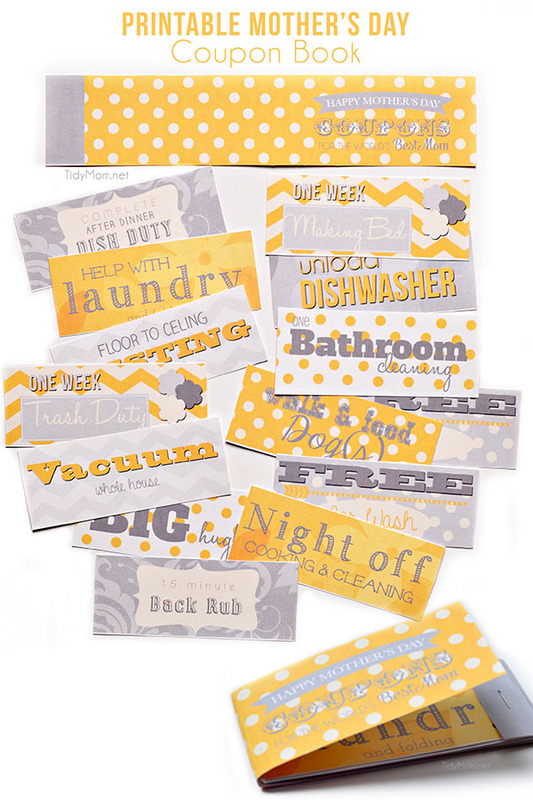 Don’t forget to leave her with the gift of clean she can use all year…… a coupon book full of household chores she can “cash in” anytime! When was the last time someone cleaned the house for you? Disclaimer: I have a working relationship with 3M Scotch-Brite to promote its Gift of Clean campaign. As always, all opinions and love of a clean home are my own. I’m with you Cheryl – love it when my children give me the gift of their time. 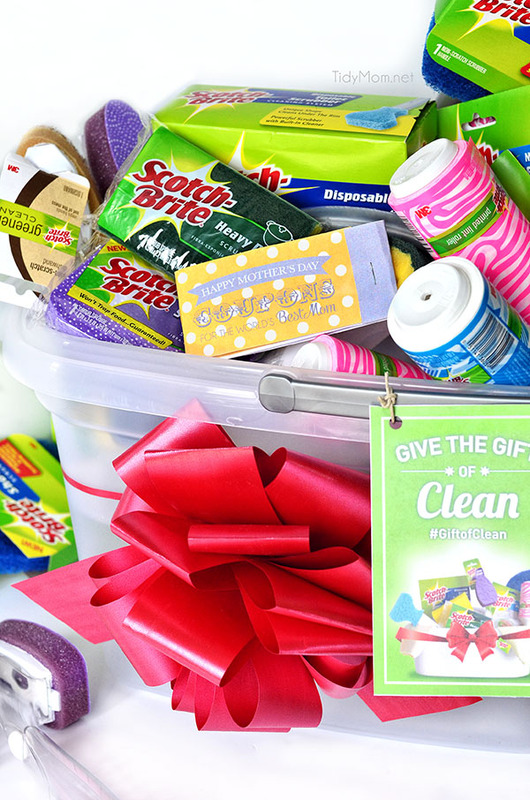 The best gift ever – a clean house! Really cute idea. You are so right! I would be in heaven if my teenage daughter kept her room clean. Her room is right by our stairs and I just have to shut the door otherwise it drives me crazy. I need to print your cute printables and give them to my kids to give to me. I’m pretty sure they haven’t even thought about Mother’s Day. Totally agree here. I would LOVE to have a clean house as a Mother’s Day gift as opposed to breakfast in bed or anywhere else for that matter. 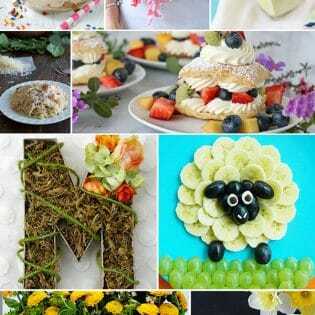 Pingback: Great Ideas -- 20 Last Minute Mother’s Day Projects! Cheryl, these coupons are super cute! Any mom would love to receive these! Happy Mother’s Day to you! Pinning! Very cute idea! Love it!! Thanks for sharing. I love your mother day coupons, they are so pretty and I hope you don’t mind that I included them in my mothers day printable round-up with a small image and link back to your site. My mom is going to love this! It is such a great idea. Except for the part that I have to do all these things. But my mom really deserves this! Thank you Cheryl!